Paid cash for this mower on 4/5/09 Cut my grass twice,Had to carry it 35 miles away to a repair shop.Had problem from day one with BAD Battery.,After cutting grass 2 times had Belt Issues.It cost me 56.81 to replace a belt used it 2 more times and guess what? Thats right back to the Lowes Stores this time and for the SAME ISSUES - Battery and Belt.Hope to finally get mower back this Thursday hope to use it more than 2 times before I have any other ISSUES. So aLL TOGETHER MOWER HAS BEEN IN A REPAIR SHOP NOW OVER 6 WEEKS.SO THINK TWICE BEFORE SPENDING OVER 1500 FOR A NEW TROYBILT BRONCO 42 CUT MOWER.THEY COME WITH FACTORY 2 YEAR WARRANTY SO FAR IHAVE REALLY HAD TO USE MINE -JUST REMEMBER BELTS ARE NOT UNDER WARRANTY SO BE PREPARED TO SPEND 56.81 FOR A NEW ONE AFTER ONLY USING MOWER TWICE. I just started my second mowing season and my Bronco, which is on it's third deck belt, threw the belt six times yesterday. From searching on the internet it appears Troy Bilt / MTD has a known issue with the deck belts popping off during disengaging the deck but doesn't seem to be correcting the issue. When I see people looking at a Bronco in Lowes and I walk over and tell them to get something else. My perception of Lowes is lowered as long as I know they are still selling this junk mower. Worse riding mower on market. We bought this mower 4 yrs. ago and it finally laid down and died. This was after every year used taking it to be repaired for something all the time. This year used one time and motor and starter locked up and quit. The 1st one I bought broke down within two weeks and Lowe's replaced the mower. The second one I used for one mowing season. This year I have not used at all. 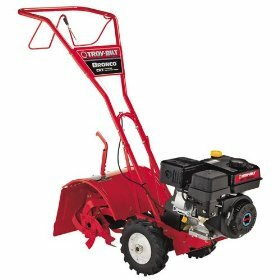 It has been in the shop for over two months and Troy Bilt continues to give me and the service agent the run-around. I am paying someone to mow my yard and I own a new mower. Do Not Buy Troy Bilt. They are not built for life and they do not stand behind their products. This lawn mower has cost me $40 in pick up fees and over $300 to have my yard mowed by someone else this year.